NEW YORK - 년경 8 월 2016 - 세계 무역 센터의 기지에서 새로운 오큘 러스 교통 및 쇼핑 허브의 천장에서 찾고. 새로운 자유 탑 유리 천장의 중심을 알 수있다. 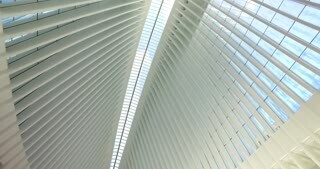 NEW YORK CITY - Circa October, 2017 - An interior establishing shot of the Oculus transportation hub and shopping center near the World Trade Center in Manhattan.